"41AN1-29, Burial E-5" by Timothy K. Perttula and Robert Z. Selden Jr.
DECORATION: The rim has nine engraved panels—all rectangular—set between horizontal engraved lines under the lip and at the carination. The panels are defined by two vertical engraved lines at opposite ends of the rectangle, with triangular hatched areas in each corner. Poynor Engraved, var. 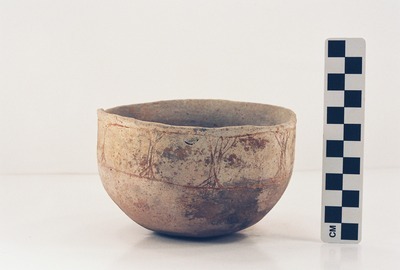 Blackburn carinated bowl (Vessel 41AN1-29).